This week is World Antibiotic Awareness Week and today (18 November) is European Antibiotic Awareness Day. These events are aimed at increasing awareness of antibiotic resistance and encouraging best practices to reduce emergence and spread of antibiotic resistance. The Animal and Plant Health Agency (APHA) is national veterinary and World Organisation for Animal Health (OIE) Reference Laboratory for antimicrobial resistance. Tackling antimicrobial resistance (AMR) is a global priority and APHA is involved in work to identify and control endemic and exotic bacterial disease threats and the rise in resistance to antibiotics presents a threat to both animal and human health. A critical step is surveillance of antibiotic resistant infections to provide evidence on trends and sources and emergence of new resistance as well as informing appropriate treatment. We’d like to provide some insight into how new discoveries are made by APHA scientists and how important international collaboration is to our work. The rise and spread of antimicrobial resistance has meant that the antibiotic colistin has assumed great importance in human medicine over the last decade. Colistin is considered a drug of last resort in human medicine and is usually reserved to treat bacteria, for example E. coli, which are resistant to all other antibiotics. It has been used in Europe for decades to treat intestinal infections in farm animals, although in the UK, it has only more recently been used to treat infections in animals. A year ago today, The Lancet Infectious Diseases UK Medical Journal published a scientific paper from researchers in China, UK and USA describing the detection of transferable colistin resistance in bacteria from pigs, meat and human patients in China. Before this report, colistin resistance had been detected, but had only been able to spread from a mother bacterial cell to her two daughter cells (termed vertical spread). Spread from, for example, an E. coli bacterium to an unrelated Salmonella bacterium (termed horizontal spread) had not been detected. This all changed in November 2015 with the Lancet report. 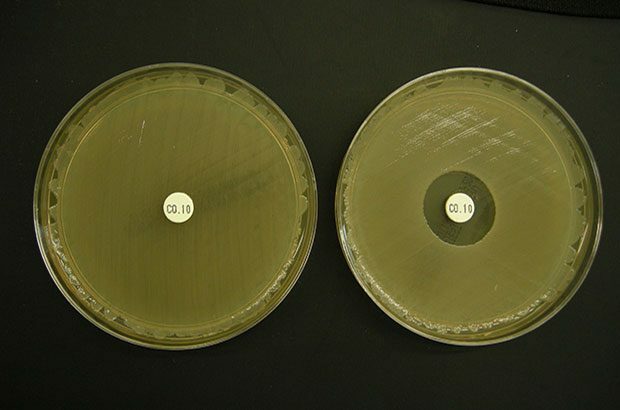 Resistance was detected which was present on a plasmid (a circle of DNA separate and distinct from the bacterial chromosome) which could be transferred between bacteria, even bacteria of different species. The diagram below shows how plasmid transfer occurs between bacteria; plasmids commonly carry genes encoding antimicrobial resistance. What was the practical relevance of this? Well, up until then it was thought that resistance to colistin would only develop and spread slowly. Now that transferable resistance had been detected, it was likely that colistin resistance would spread much more quickly, possibly making colistin increasingly redundant as a last treatment option. Because of the importance of colistin, APHA coincidentally had a pig herd under investigation at this time, identified through the scanning surveillance of pig diseases. The farmer and farm vet had noticed that colistin was no longer working to treat piglets with post-weaning diarrhoea and had reported their observations to our Veterinary Investigation Centres and we had been investigating samples from the farm. These investigations identified colistin-resistant bacteria in pigs on the farm and we were in the process of investigating whether the resistance was transferable. In liaison with the Veterinary Medicines Directorate (VMD), we decided to prioritise this issue and relevant teams across APHA began to investigate whether we were seeing the same type of resistance which had been reported in China. The day after the report was published in The Lancet, APHA’s initial results provided first confirmation that the transferable colistin resistance gene (mcr-1) detected in China was indeed present in the colistin-resistant bacteria from pigs on the UK farm. The following weeks and months were very busy as we undertook investigations to assess how widespread mcr-1 might be. We were contacted by BBC Panorama about colistin resistance for a programme they were making on antimicrobial resistance and several government departments requested briefings. In response to the findings, the VMD in conjunction with other agencies, including Public Health England and the Food Standards Agency, assessed the implications of colistin resistance for public health (veterinary medicines). Following the detection of the mcr-1 gene, the Pig Veterinary Society re-categorised colistin in its Prescribing Principles for Antimicrobials as an antibiotic of last resort, where use must be supported by laboratory sensitivity tests. From studies in other countries we now know that this type of resistance has been around for much longer than was first thought, with reports of sporadic detection of mcr-1 in E. coli from chickens from 2004 and 2006 and before that time in China. The surveillance findings were reported in the Veterinary Record by the APHA Pig Expert Group (Surveillance focus) and the work to characterise the resistant bacteria was the subject of a scientific publication in the Journal of Antimicrobial Chemotherapy. APHA findings were submitted to the European Medicines Agency who reviewed the use of colistin in animals in the EU and has updated advice on the use of colistin products in animals, recommending these medicines should only be used as second line treatment in animals and that their sales should be minimised to reduce the risk of resistance. This work demonstrates the importance and value of linking surveillance and research activities at APHA to rapidly investigate and respond to new threats; including those with potential public health impact as well as our key role in the protection of animal health and welfare. The finding also highlights the value of assessing the cause of treatment failure. In recent months The Agriculture and Horticulture Development Board (AHDB) Pork has launched an electronic medicine book for pigs (eMB-Pigs) enabling the industry to record more accurate on farm antibiotic use which will also provide anonymised, aggregated national data on antibiotic usage to VMD, when needed. The National Pig Association has also launched an antibiotic stewardship programme to minimise the use of antibiotics in the pig sector, consistent with responsible human and food animal medicine. 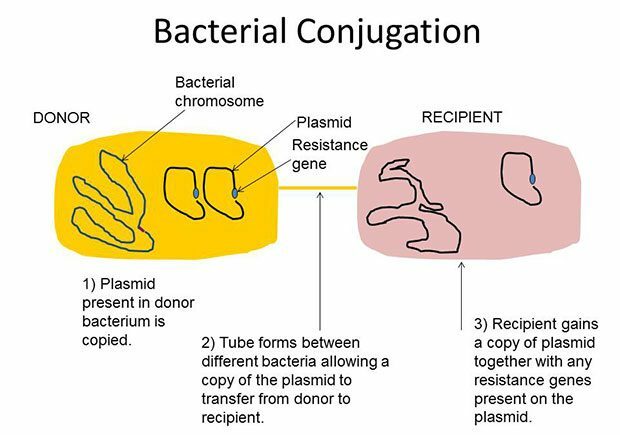 Bacterial conjugation is a process in which 2 bacteria become temporarily linked by a tube-like structure and then transfer genetic material from one to another on circles of DNA called plasmids. Plasmids commonly carry resistance genes. Antibiotic resistance is one of the biggest threats facing us today. Pledge to become an Antibiotic Guardian and select a simple action you can take which will protect our antibiotics. Surveillance focus: Monitoring of colistin resistance in pigs in scanning surveillance submissions. Colistin resistance in salmonella and Escherichia coli isolates from a pig farm in Great Britain. Updated advice on the use of colistin products in animals within the European Union: development of resistance and possible impact on human and animal health EMA/CVMP/CHMP/231573/2016. VMD assesses the implications of colistin resistance in UK pigs. Emergence of plasmid-mediated colistin resistance mechanism MCR-1 in animals and human beings in China: a microbiological and molecular biological study.